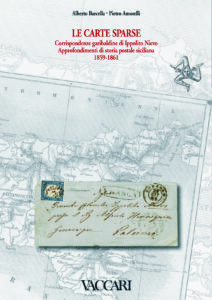 Second, also in the “New Books Noted” section (page 211) under the title of “Sicily” the publisher of the book titled La Carte Sparse: Corrispondenze garibaldine di Ippolito Nievo Approfondimenti di storia postale siciliana 1859-1861 by Barcella Alberto and Amorelli Pietro was incorrectly identified as Unifacato. It instead should be Vaccari as the publisher of the book. This title is however also available though Vaccari’s History Through Documents series as indicated in the listing. We apologize for any inconvenience this may have caused and welcome any comments or questions regarding anything that appears in the quarterly journal from our readers.